The Shidler College of Business leads in the Asia-Pacific region, providing students with an in-depth understanding of the best business practices, an awareness of languages and cultures, and use of emerging technologies within a complex global environment. The College offers a wide selection of degree, certificate and executive programs in a multicultural environment enhanced by collaborative learning, research projects, international speakers, internships, study abroad and career opportunities. Ranked among the top 25 institutions for international business and the only AACSB accredited MBA program in Hawaii, the College equips its graduates with the ability to learn and to lead throughout their lifetime. The Shidler College of Business leads in the Asia-Pacific region, providing students with an in-depth understanding of the best business practices, an awareness of languages and cultures, and use of emerging technologies within a complex global environment. The College offers a wide selection of degree, certificate and executive programs in a multicultural environment enhanced by collaborative learning, research projects, international speakers, internships, study abroad and career opportunities. Ranked among the top 25 institutions for international business and the only AACSB accredited MBA program in Hawaii, the College equips its graduates with the ability to learn and to lead throughout their lifetime. In order to join UHM's diverse community of students, applicants must have a minimum GPA of 3.0 and a minimum GMAT score of 500. The school requires that its applicants have at least two years of post-graduate, full-time work experience. Because international students representing more than 80 countries account for about 25 percent of UHM gradua...In order to join UHM's diverse community of students, applicants must have a minimum GPA of 3.0 and a minimum GMAT score of 500. The school requires that its applicants have at least two years of post-graduate, full-time work experience. Because international students representing more than 80 countries account for about 25 percent of UHM graduate student population, the TOEFL is required. Students whose native language is not English must score at least a 600 (paper-based) test 250 (computer-based). Students who score 550/213 are considered, but will be tested again by the university's English Language Institute. One look at the school's website should tell you all you need to know about campus life at the University of Hawaii, Manoa. Palm trees, mountains, airy beaches, and wide expanses of deep blue sea abound. As one student says on the school's site: "Life in Hawaii... well, what can I say? It's Hawaii!" Another student adds, "Located in beautiful Hawaii, UHM is an ideal location for students who are looking for a change of scenery. The students are extremely diverse, and the program is very flexible to accommodate various needs." And another student points out that the great thing about UHM is that "the location and the diverse student body make it exciting to learn. There are people who are here for different reasons, so it is exciting to meet engineers, psychologists, astronomers, chemists, and economists. The city and community is beautiful and safe." Still, many students feel that "the facilities at this school could stand a lot of improvement, and the negative attitude of most of the faculty toward technology is unacceptable." Many students strongly feel that "the friendships made from the intensive group work make up for all this. In my first semester alone, I have made several friends I am proud to call my friends for life." But others point out that because it's a commuting campus, "extracurriculars are limited, especially with students working full-time. But the Graduate Business Students Association does put on monthly ‘relaxers' after classes to get the students to mingle with each other and with professors." Relaxers provide drinks, snacks, and a place to socialize, and students consider them "a good but rare offering." Also, many students feel that "it would be great if the school could involve the spouses and families a bit more. More opportunities to meet socially, instead of just academically (for group work) would be great." Many students who graduate from UHM remain in Hawaii to work, though some return to the United States mainland or to Asia, and students are wild about the "networking opportunities for international and local students across Asia and the Pacific Rim." Employers of recent MBAs include AIG Insurance, Bank of Hawaii, Booz Allen Hamilton, PricewaterhouseCoopers, First Hawaiian Bank, Foodland, Frito Lay, Nabisco, Hewlett-Packard, Hilton Hotels, the Internal Revenue Service, and many others. Many MBAs have also been inspired to start their own businesses after their time at UHM. Still, some students feel that the alumni network could be improved. One student says, "It would be great if the alumni could get more involved with the program. I am lucky to have a good alumnus who takes participation in my attendance, but I wonder if my other classmates are just as lucky." For most students at the University of Hawaii College of Business, the most exciting thing about their program is "its proximity to Asia and the large number of Chinese and Japanese students." Because so many students plan to go on to work in the rapidly growing markets of Asia, the program is not only helpful to their education, but also to their manners. Through a variety of exchange programs, as well as friendships with students from so many different cultures, students learn how to interact with cultures not their own, and, in many cases, learn how to avoid embarrassing social gaffes that could spoil a deal. As one student says, "[The school's] greatest strengths are the international business ties the school has with countries around the Pacific Rim. The MBA program offers exchange opportunities like the PACIBER program, which requires fluency in a language spoken in the Pacific region other than English, one semester of study abroad, and an internship with a focus on international business." 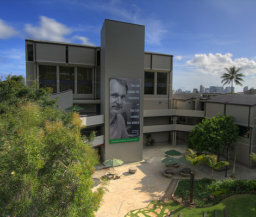 UHM's MBA program is a general one, and its classes are all taught at night to accommodate the needs of its many working students. Students can choose part-time or full-time courses of study and can pick from the following departments: financial economics and institutions, information-technology management, management and industrial relations, marketing, and the school of accountancy. In addition, the school offers a variety of dual degree programs (MBA/MA, or MBA/MS, and JD/MBA) and a Japan- or China-focused MBA: a full-time, 15-month specialized program. As far as students are concerned, however, all of the departments have one strength in common: "The professors! They are the ones who point you in the right direction and help with the networking process." Another student concurs, adding that the school is home to "great and knowledgeable faculty. My classmates are also excellent." And because of the nontraditional curriculum and the small program, "in general, the environment is noncompetitive." Although there are few complaints about the curriculum, some students feel that "the offerings of noncore classes could be increased, especially in the areas of finance and marketing." Others make the case that "academically, the school could make the course work more vigorous, but with more than 50 percent of the students working full-time, those students may not be able to accommodate more rigorous work." Another student agrees and adds that "though the classes require a lot of work, I think that in general they should be more challenging." In keeping with the multinational tone of the school, one of the more popular aspects of the College of Business Administration is their study-abroad program. The school has multiple exchange programs with universities in Asia and Europe and a summer Asian field-study elective, which "enables students to earn six credits while visiting factories and other businesses in four Asian countries." As one student says, " I went on a three-week long field study, where we visited Korea, Japan, and Thailand. As a group of 15 students with a well-known advisor, we were able to visit with executive managers at companies such as Nissan, POSCO, and K. Cotton." UHM also offers a number of different international activity groups, such as the Academy of International Business; the Asia Pacific Economic Cooperation (APEC) Study Center, the Asia-Pacific Financial Markets Research Center, the Family Business Center of Hawaii, the Pacific-Asian Center for Entrepreneurship and E-Business, and the Native Hawaiian Leadership Project. Full-Time MBA, 48 credits, 16 - 21 months; Part-Time MBA, 48 credits, 30 - 36 months; Executive MBA (EMBA), 48 credits, 22 months; Master of Accounting (MAcc), 30 credits, 12 months; Japan-focused MBA (MBA), 48 credits, 21 months; China International MBA (MBA), 48 credits, 21 months; Vietnam Executive MBA (VEMBA), 48 credits, 22 months; Master of Human Resource Management (MHRM), 30 credits, 16 months; PhD in International Management (PhD), 4-5 years; Full-Time MBA; Part-Time MBA; Executive MBA; China International MBA; Japan-focused MBA, Vietnam Executive MBA; Master of Accounting; Master of Human Resource Management; JD/MBA; PhD in International Management. Certificate in International Management or Entrepreneurship. Instructional Resource Center, Behavior Research Laboratory, The Sunset Reference Center, The Asia-Pacific Center for Executive Development, Academy of International Business, The Asia Pacific Ecomonic Corpoartion Study Center, The Center for Japanese Global Investment and Finance, The Pacific Asian Management Institute, The Center for International Business Education and Research, The Hawaii Real Estate Research and Education Center, The Pacific Business Center, and The Pacific Research Institute for Information Systems and Management. China, Denmark, Germany, Hong Kong, Japan, Korea, Singapore, Taiwan, Thailand, France, Finland. Richard Leung - Managing Director & Head of Wealth Management, UBS Securities Company Ltd.
Want more info about University of Hawaii, Shidler College of Business Full Time MBA? Get free advice from education experts and Noodle community members.